Liu is the principal investigator of CHANS-Net and director of the Center for Systems Integration and Sustainability (CSIS) at Michigan State University, where Carter studies. The research was funded by the National Science Foundation and others. 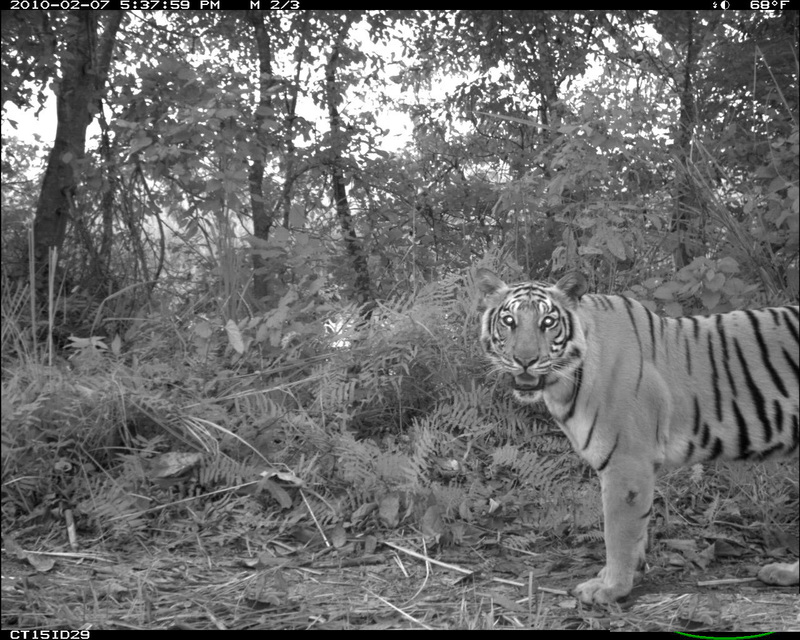 Conventional conservation wisdom is that tigers need lots of people-free space, which often leads to people being relocated or their access to resources compromised to make way for tigers. “It’s a very fundamental conflict over resources,” Carter said. “Tigers need resources, people need the same resources. If we operate under the traditional wisdom that tigers only can survive with space dedicated only for them, there would always be conflict. If your priority is people, tigers lose out. If yourpriority is tigers, people lose out. Carter’s cameras give a rare look at activity. 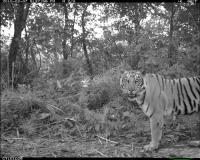 Tigers globally may be out of sight, but not out of mind. Since the start of the 20th century, the world’s population of wild tigers has dropped by 97 percent to approximately 3,000 individuals. The world’s remaining tigers are being pushed into small spaces, and being able to share that space with humans is a critical survival skill. In addition to Liu, who holds the Rachel Carson Chair in Sustainability, and Carter, the PNAS paper “Coexistence between wildlife and humans at fine spatial scales” was written by Binoj Shrestha of the Institute for Social and Environmental Research in Nepal, Jhamak Karki of Nepal’s Department of National Parks and Wildlife Conservation and Narendra Man Babu Pradhan of the World Wildlife Fund in Nepal. In addition to NSF, the research was funded by NASA, the U.S. Fish and Wildlife Service Rhinoceros and Tiger Conservation Fund and MSU AgBioReseach. It was part of the Partnership for International Research and Education among MSU, the University of Michigan and seven other institutions in the United States, Nepal, and China.